Pastel sketch ranch made by me Gloria Poole, Registered Nurse and artist of Missouri on 24-Sept-2015-9×12-pastels. 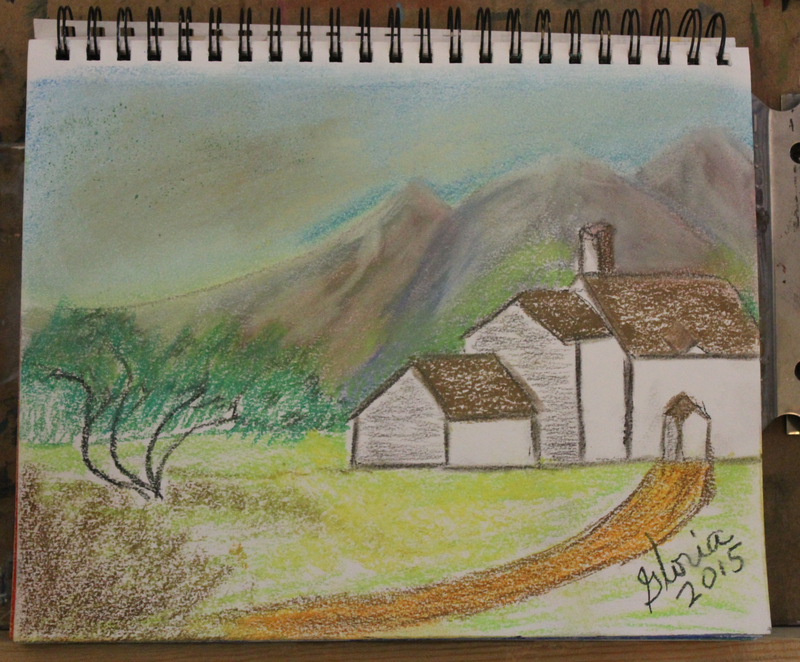 I drew this with “soft pastels” and I revised it a few times. I was trying to learn the techniques for painting with pastels so it was a practice sketch. It is the first sketch ever that I made using that medium. I have made many sketches before with what I call powdered pastels [ a brand PanPastels] which are totally different and have more binder in them. I have also made about 1050 other sketches using acrylic, watercolor, gouche, oil pastels, inks, charcoal, pencils, inktense, tempra, encaustic and chalk. I also made another sketch today which is sketch 2 with that particular soft pastels medium and I put it and 2 others on my https://artist-gloriapoole.blogspot.com. I signed this with a marker since I did not have any tool for soft pastels precise enough to sign my name with. This is 9 x 12 in my sketchbook of the moment. I photographed it a few times with different cameras and uploaded it and posted it to this blog of mine. copyrighted. You can see more of the art I made on these blogs of mine: http://gloriapoole.livejournal.com; and on https://gloriapoole.blogspot.com; and on https://gloriapoole-paintings.blogspot.com. Also please art I made on https://gloriapoole.wordpress.com; and https://gloriapoole.blogspot.com; and also on another blog of mine at https://gloria0817.blogspot.com; and also on https://gpoole817.blogspot.com; and also on one of my life blogs at https://tapestry-of-life-LLP.blogspot.com; and also on my http://gloriapoole-UK.livejournal.com; and on other blogs of mine also. I incorporate by reference all copyrights , all selfies, all statements., all symbols that represent me, as are on other blogs of mine. This blog and all content, all words, all photos and all art on it, are owned by me and were created and posted by me Gloria Poole , RN, artist of Missouri and Georgia, signed by me, photographed by me and uploaded by me, and I own all rights to it collectively and individually. Copyright notice :I, [ Gloria Poole] , own all rights to all content on this blog. Usually I sign the art I create as simply Gloria since that is my first name, that I was born with; but on pencil and or ink drawings I sometimes also sign my born with surname of Poole which is my legal name again because I resumed it by Court order after both divorces. I am also known on the web and in real life as Gloria; Gloria Poole; Gloria J Poole; Gloria Poole, RN, artist; and on the web as : gloriapoole; gloria-poole; gloria.poole; Ms Gloria Poole; gloriapoole.RN; gloriapoole_RN; gloriapooleRN at yahoo; gloria0817; gpoole817; artist-gloriapoole; gloriapoole-paintings; artist-gloria; Poole,Gloria; gloriapoole1749; and other variations of my real, born with, and legal name of Gloria Poole. For the record, I am a white, single-again, twice divorced, Southern Baptist, born again, Christian, woman and the mother of only two children who are grown daughters who are named Jennifer and Leigh. I am also a prolife activist, blogger, artist in all mediums; photographer for my own purposes, Registered Nurse with a license in Missouri but before that for most of my life in the state of Georgia, U.S. citizen born in the state of Georgia; University of Georgia alum, Georgia Baptist College of Nursing alum, writer, illustrator, author, personhood promoter. This blog may not be downloaded, nor copied individually or collectively as a whole; nor have domains forwarded to it that do not belong to me, nor may the photos or art on it be reproduced or saved to disk by anyone . Repeat for emphasis: I create all content on this blog and I, Gloria Poole, own all rights to this blog collectively and individually as single posts. All telephones listed on this account and any account of mine on the web belong to me personally and are in my apartment in Missouri or in my possession at all times. Some of my numbers are wired, landline telephones and some are mobile phones. This blog and all blogs that I create and that contain my words I wrote and or art I made and signed and or photos that I photographed belong exclusively to me Gloria Poole, of Missouri and Georgia. Copyright. Gloria Poole / Gloria / gloriapoole /gloria-poole /gloria.poole/ Ms Gloria Poole/ Poole Gloria / G-L-O-R-I-A / gloriapoole1749 /gloria0817 /gpoole817 / gloriapooleRN at yahoo / gloriapoole.RN / artist-gloriapoole /Gloria Poole,RN,artist /cartooning-by-gloriapoole / photo-by-gloriapoole, and other variations of my real name with or without my professional status as Registered Nurse and with or without numbers after my name, at my own private apt in Missouri which is not shared with anyone and neither is my equipment nor phones shared with anyone, and neither is my isp account shared with anyone which means no one is authorized to log into any account of mine anywhere but me. /signed/ Gloria Poole, RN, artist; at my apt in Missouri on 25th Sept 2015 at 2:06pm. Meteor sketch made by me Gloria Poole,Registered Nurse, artist of Missouri -Sept-2015-9×12 inch paper sketchbook with watercolor. I drew this,painted it with watercolor, left white space around “stars” , put glitter on the meteor path , signed it, photographed it, uploaded it, and posted it to this blog of mine today 17th Sept, 2015. Copyrighted. Copyright notice :I , [Gloria Poole], CREATE all content on this blog and I own all rights to all content on this blog. Usually I sign the art I create as simply Gloria since that is my first name, that I was born with; but on pencil and or ink drawings I sometimes also sign my born with surname of Poole which is my legal name again because I resumed it by Court order after both divorces. I am also known on the web and in real life as Gloria; Gloria Poole; Gloria J Poole; Gloria Poole, RN, artist; and on the web as : gloriapoole; gloria-poole; gloria.poole; Ms Gloria Poole; gloriapoole.RN; gloriapoole_RN; gloriapooleRN at yahoo; gloria0817; gpoole817; artist-gloriapoole; gloriapoole-paintings; artist-gloria; Poole,Gloria; gloriapoole1749; and other variations of my real, born with, and legal name of Gloria Poole. For the record, I am a white, single-again, twice divorced, Southern Baptist, born again, Christian, woman and the mother of only two children who are grown daughters who are named Jennifer and Leigh. I am also a prolife activist, blogger, artist in all mediums; photographer for my own purposes, Registered Nurse with a license in Missouri but before that for most of my life in the state of Georgia, U.S. citizen born in the state of Georgia; University of Georgia alum, Georgia Baptist College of Nursing alum, writer, illustrator, author, personhood promoter. This blog may not be downloaded, nor copied individually or collectively as a whole; nor have domains forwarded to it that do not belong to me, nor may the photos or art on it be reproduced or saved to disk by anyone . Repeat for emphasis: I create all content on this blog and I, Gloria Poole, own all rights to this blog collectively and individually as single posts. All telephones listed on this account and any account of mine belong to me personally and are in my apartment in Missouri or in my possession at all times. Some of my numbers are wired, landline telephones and some are mobile phones. This blog and all blogs that I create and that contain my words I wrote and or art I made and signed and or photos that I photographed belong exclusively to me Gloria Poole, of Missouri and Georgia. Copyright. Gloria Poole / Gloria / gloriapoole /gloria-poole /gloria.poole/ Ms Gloria Poole/ Poole Gloria / G-L-O-R-I-A / gloriapoole1749 /gloria0817 /gpoole817 / gloriapooleRN at yahoo / gloriapoole.RN / artist-gloriapoole /Gloria Poole,RN,artist /cartooning-by-gloriapoole / photo-by-gloriapoole, and other variations of my real name with or without my professional status as Registered Nurse and with or without numbers after my name, at my own private apt in Missouri which is not shared with anyone and neither is my equipment nor phones shared with anyone, and neither is my isp account shared with anyone which means no one is authorized to log into any account of mine anywhere but me. /signed/ Gloria Poole, RN, artist; at my apt in Missouri on 17th Sept 2015 at 7:54aam. Ink drawing of gnarled tree made today by Gloria Poole,RN, artist, in/ of Missouri 8-Sept-2015-9×12 on paper. copyrighted. Also see other #art I made this past week on these blogs of mine: http://gloriapoole.livejournal.com——————————————————————————————-http://gloriapoole-UK.livejournal.com——————–https://gloriapoole.blogspot.com———————-https://artist-gloriapoole.blogspot.com———-https://gloriapoole-paintings.blogspot.com———————https://gpoole817.blogspot.com—————-https://gloria0817.blogspot.com———————————–https://gloriapoole.wordpress.com——————-https://sites.google.com/site/PooleGloria———-https://tapestry-of-life-LLP.blogspot.com—————————-https://words-that-work-LLP.blogspot.com——https://cartooning-by-gloriapoole.blogspot.com ———–and other sites & blogs of mine also. I incoporate all selfies, all statements, all symbols,all copyrights of mine into this blog by reference. See them on my https://gloriapoole.blogspot.com. The weird formatting of this paragraph is because wordpress is trying to squelch me on web for being heterosexual and prolife CHRISTIAN, woman. So, if you are Christian then pray for them. You can follow me on twitter : @gloriapoole and @gloria_poole and also on other twitters not so obvious. see info below please. Copyright notice :I Gloria Poole, own all rights to all content on this blog. Usually I sign the art I create as simply Gloria since that is my first name, that I was born with; but on pencil and or ink drawings I sometimes also sign my born with surname of Poole which is my legal name again because I resumed it by Court order after both divorces. I am also known on the web and in real life as Gloria; Gloria Poole; Gloria J Poole; Gloria Poole, RN, artist; and on the web as : gloriapoole; gloria-poole; gloria.poole; Ms Gloria Poole; gloriapoole.RN; gloriapoole_RN; gloriapooleRN at yahoo; gloria0817; gpoole817; artist-gloriapoole; gloriapoole-paintings; artist-gloria; Poole,Gloria; gloriapoole1749; and other variations of my real, born with, and legal name of Gloria Poole. For the record, I am a white, single-again, twice divorced, Southern Baptist, born again, Christian, woman and the mother of only two children who are grown daughters who are named Jennifer and Leigh. I am also a prolife activist, blogger, artist in all mediums; photographer for my own purposes, Registered Nurse with a license in Missouri but before that for most of my life in the state of Georgia, U.S. citizen born in the state of Georgia; University of Georgia alum, Georgia Baptist College of Nursing alum, writer, illustrator, author, personhood promoter. This blog may not be downloaded, nor copied individually or collectively as a whole; nor have domains forwarded to it that do not belong to me, nor may the photos or art on it be reproduced or saved to disk by anyone . Repeat for emphasis: I create all content on this blog and I, Gloria Poole , own all rights to this blog collectively and individually as single posts. All telephones listed on this account and any account of mine on the web belong to me personally and are in my apartment in Missouri or in my possession at all times. Some of my numbers are wired, landline telephones and some are mobile phones. This blog and all blogs that I create and that contain my words I wrote and or art I made and signed and or photos that I photographed belong exclusively to me Gloria Poole, of Missouri and Georgia. Copyright. Gloria Poole / Gloria / gloriapoole /gloria-poole /gloria.poole/ Ms Gloria Poole/ Poole Gloria / G-L-O-R-I-A / gloriapoole1749 /gloria0817 /gpoole817 / gloriapooleRN at yahoo / gloriapoole.RN / artist-gloriapoole /Gloria Poole,RN,artist /cartooning-by-gloriapoole / photo-by-gloriapoole, and other variations of my real name with or without my professional status as Registered Nurse and with or without numbers after my name, at my own private apt in Missouri which is not shared with anyone and neither is my equipment nor phones shared with anyone, and neither is my isp account shared with anyone which means no one is authorized to log into any account of mine anywhere but me. /signed/ Gloria Poole, RN, artist; at my apt in Missouri on 8th Sept 2015 at 3:08pm. Gloria Poole / Gloria / gloriapoole / [Ms ] Gloria Poole,RN,artist of / in Missouri, USA/ gloriapoole1749/ gloria-poole/ gloria.poole /gloria0817 .